WordPress Directory Themes – Efficient way to search Business Listings. WordPress Directory themes are great themes to list your local business, events, or classifieds adverts. Perfect to build your online directory. A lot of successful online directories provide the best services and products. You can provide the listing of business in your website as free or charge a fees. A good directory theme is eye catching as it attracts lot of visitors. It is responsive , easy to navigate and allows easy filtering of data. Google maps are also integrated . Above all it is easy customize these themes. From a businessman point of view these themes are one of the best marketing strategy. As it provide good space for business advertising. 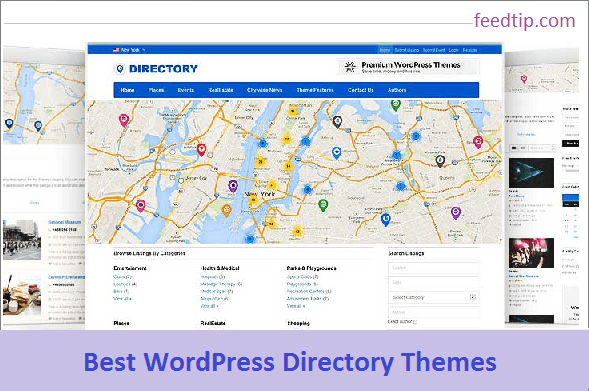 Below is the list of best WordPress directory themes. Listify is a responsive directory wordpress theme. It can be used to list wide array of businesses – as a real estate listing website, car listing, travel websites, home services, restaurants etc. Apart from using as directory website you can also use this theme to make restaurant guide website, a membership website, a gift certificate selling website etc. The theme design is beautiful and at the same time functional. It has a beautiful video header. With this theme you can easily build a reservation system as it supports Open table, WooCommerce bookings, Resurva and Guestful. SEO optimized and follows Schema guidelines. Listify is compatible with wide list of plugins- WooCommerce, Contact Form 7, Wp Job Manager, Gravity Forms, Ninja Forms etc. Facilitates making making money via listing view, add lists, reservations, book an appointments etc. It is an ad friendly website as you can google ads or other ads at various spaces provided in the theme. The visitor can search the query by zip code, location , maps. He can share it on social site, bookmark the listings and create submissions in front end. A very solid design with lot functional features. Directory Portal is a responsive wordpress directory theme. 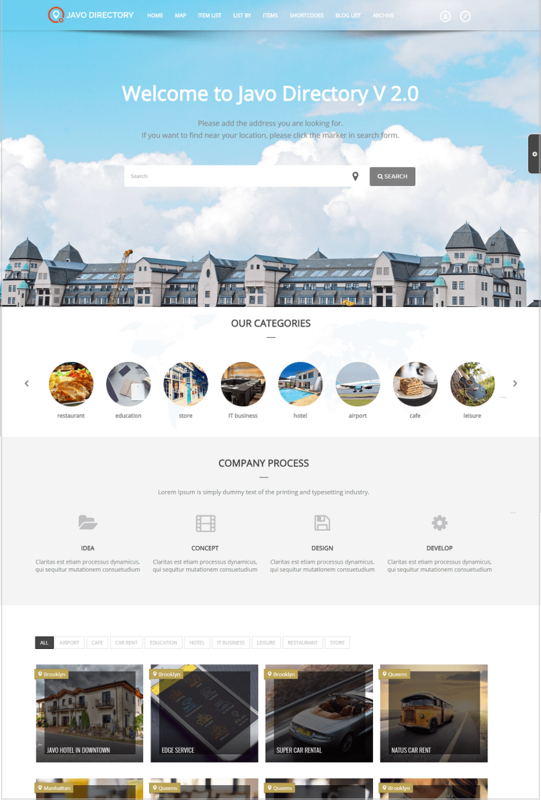 No 1 selling directory theme at themeforest. The design is elegant and modern. 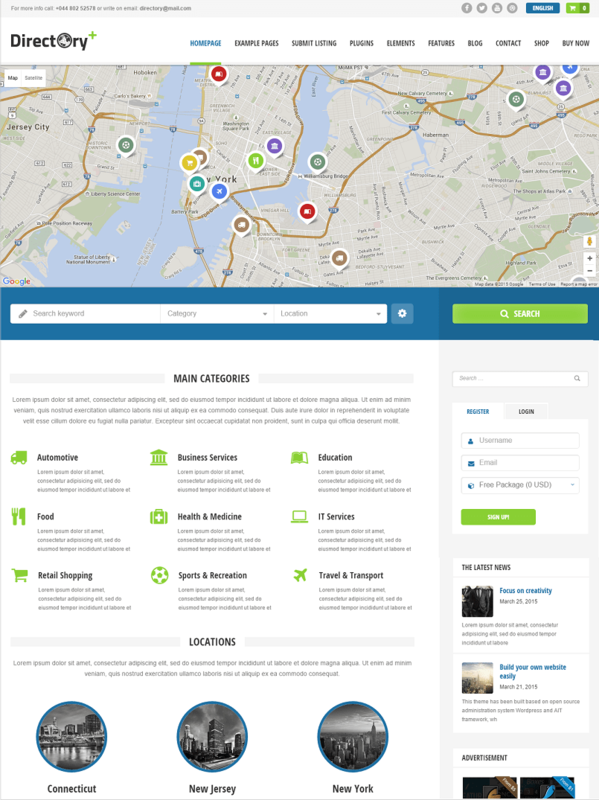 You can use this theme for online listings of any business. SEO optimized theme with tools. The theme has a 7 header styles – video header, 3D Google map, Street product view, revolution slider, standard google map, business view etc. 3D and video headers are awesome unique feature to attract visitors. There are 8 homepage layouts, 30 page elements, google fonts, 12+ column layouts,shorcodes, unlimited sidebars via sidebar manager, mega menu, google rich snippets etc. The AIT language plugin added in the theme make the website a multilingual one. Directory Portal supports WooCommerce to make your online shop.The theme is compatible with Items Riview, Claim Listings, PayPal Payment, Easy Admin and PayPal Subscriptions. Newsletter system MailChimp is also compatible. Ad friendly theme with make it easy to insert ads at pre-designed spaces. Impressive way to present price tables, services, job offers, events etc. It easy to customize the theme by using AIT Page Builder, add blog posts anywhere in the page, add portfolios, drag & drop elements , add new listings, top rated listings plus there is lot more. There is so much in options and features that you will love. A complete powerful package for your online directory. Javo is a premium responsive directory wordpress theme. Build with bootstrap 3.2 framework. Retina Ready .5 home page layouts. Includes Free addons worth $63 – Revolution Slider, Visual Composer & Ultimate VC Addons. With visual composer you can create unlimited page styles. Newsletter mail system MailChimp is integrated in the theme. This allows you to send easy and well designed newsletters. The drag and drop builder helps in customizing the front end. You can display listings by categories, locations or custom filters. It has advanced Google Maps. PayPal is integrated. Plenty of options in terms of customization. The theme costs $59. Pro Direct is a responsive directory wordpress theme. Use this theme to create a website for travel, car listings, real estate, bookings, review etc. Based on bootstrap 3 framework. Retina Ready. It has 2 homepage layouts- One with video header other with Google Map. 2 map skin, 2 color skins Pro Direct uses ajax directory search to search your queries. The theme supports Open Table, Resurva & Guestful. One can submit directorty listings from front end . Google Maps API v.3 is used in theme. Includes 10 PSD files. Directory is a responsive multipurpose directory wordpress theme. It can be used for various online businesses listings for classified ads, business directory, hotels & restaurants,cars, music & dance, real estate, education websites, job board etc. Easily add, edit or delete directory listings from front end. Search the queries by location based – city, states, distance. WPML ready. SEO friendly theme with in build SEOmodule. AD ready theme as there in build advertising space to place ads. Supports Contact Form 7. You can add listings with an expiry date. Earn money as this theme supports paid listings also besides free and featured. It has an in build review system that is linked with listings. Revolution slider adds amazing sliders. Unlimited sidebars can be created. Multiple gateways ( Paypal, Skrill, Bank Transfer, Authorize.net) are integrated in the theme. Thus making easy for members to subscribe for website services. Easy to customize page via drag and drop builder. 7 home page layout options, unlimited color options, +650 google fonts and lot’s more. 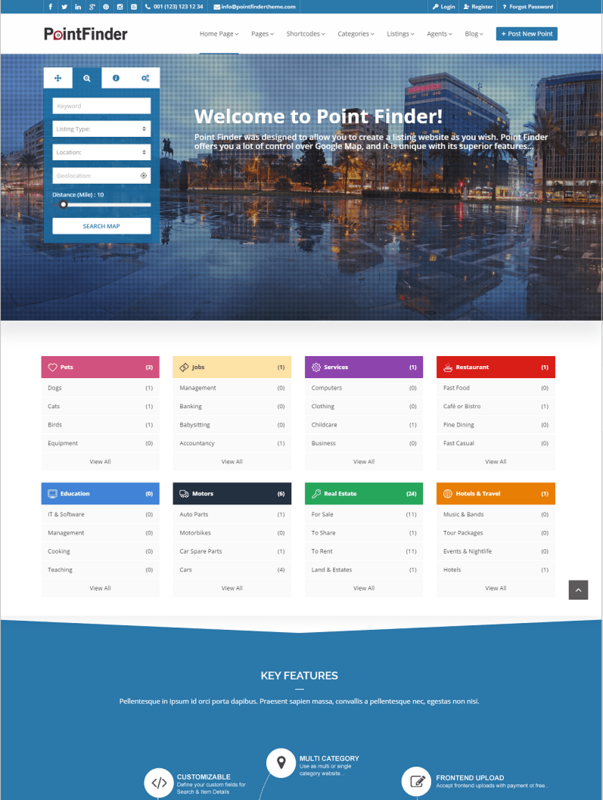 Point Finder is responsive wordpress theme for directory business. The theme is versatile as it can be used for listing multiple services as well as single services like real estate, car dealer, construction etc. It uses google map geolocation feature. One can customize color,size, contents, map style , fields and search system. With visual composer included you can customize various elements. Use drag and drop module to build custoized pages, grids etc. The visitor can upload the listings from front end and you can charge fees for listings. PayPal Payment sytem integrated in the theme ensures payment made by the vistors. Also supports Stripe PayOne can add direct payment or offline payment system also. Payments made or due can be tracked in detailed report. Social logging feauture via facebook, twitter etc is also present. reCaptcha support is also integrated. There is an inbuild review system which you can customize. Awesome revolution slide creates beautiful slides. Google maps can be customized. It has an ajax infrastructure which allows you to make different sections in the system. Mail templates can be customized by using Point Finder mail sytem. WPML ready. Headers can be customized. There is so much more in options that you will like using this theme for your business. 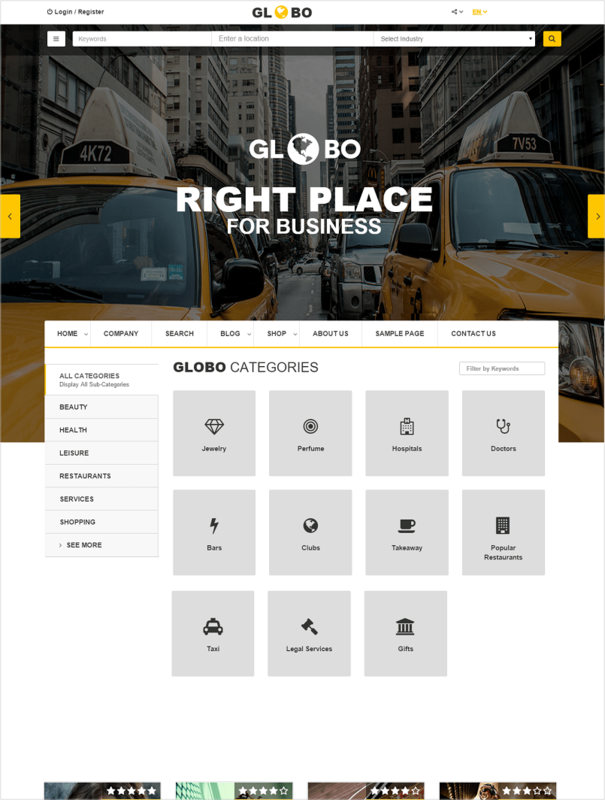 Globo is a premium responsive directory wordpress theme. The theme is modern. There are lot of page layout options. Payment Gateway Stripe & Braintree is integrated. Also supports PayPal and Credit cards. It includes the front end dashboard for companies which helps in creating unlimited company blocks. The backend is powered by Redux Framework which helps you to customize elements etc. Profiles, blogs, deals & coupons, events & customized tabs can be created. It also supports classified. Customer reviews can be checked before they are publishes. Includes shortcode generator to develop customized tabs, buttons etc. WPML ready. Customized widgets. Advanced searching is also supported. Easy to bookmark. The feature are abundant to use in your website. Sky is a responsive directory wordpress theme. This is a flexible theme as you can make listings from wide businesses – Real Estates, Health, Catering etc. There are 3 home page layouts – Directory, Vacation and Estate. Retina ready. Search queries with interactive Google maps. WPML ready make your website multilingual. Supports major payment gateways- PayPal, Authorize.net, 2CO, Google Wallet & WorldPay. Compatible with Claim listings, easyReservations, GeoDirectory, MultiLocations, Prices and Payments, etc. The drag and drop feature makes customized layouts in just few minutes. Includes layered PSD files for creating your unique designs. There are 7 customized widgets, events slider, team member etc. This premium theme costs $49.